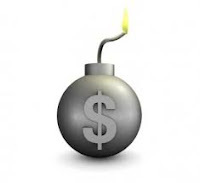 DIY Income Investor: Bomb-Proof Dividends? As we all know, these are difficult economic times. Over the past month, equities have fallen by a shockingly large margin, given the strong recovery since Autumn 2011. There is a new wave of uncertainty hitting the markets. In this situation, is it possible to find 'safe' equities? More importantly, is it possible to find 'bomb-proof' income in the form of dividends? Maybe - but it is incredibly difficult to identify companies that are not going to disappoint their shareholders with a reduced or cancelled dividend. In practice, many dividend-paying companies cut or cancelled their dividends over the last five years. The big risk that is spooking the markets is financial meltdown in Europe. So clearly we need to avoid financial stocks that might be at risk. So, pretty much all European banks and all insurers. These stocks head up the UK Dividend Achievers Index. This offers a short-cut to identifying fairly solid dividend-paying companies. However, be warned: the index included GAME last year. Motley Fool identified six baked bean and shotgun' shares for the potential financial Armageddon. This approach used the Maslow's hierarchy of needs as a baseline, selecting 'physiological needs', which includes our basic needs; air, water, and food, clothing and shelter etc. McDonald's Corporation: The international fast food company only has a 2.80% dividend yield and the p/e ratio is a whopping 19.45. The Coca-Cola Company: This iconic soft drinks company has been able to increase its dividends for the 49 years. It also has consistently strong growth and a p/e ratio of 12.5 but the dividend yield is only 2.80%, slightly lower than the dividend of 3.10% of its nearest (and smaller) competitor, Pepsico, Inc. The Procter & Gamble Company: This household goods company has a dividend yield of 3.30% after increasing it consistently since 2002; however the p/e ratio is a high 16.46. Johnson & Johnson: This company is P&G's greatest competitor but has a higher dividend yield (3.50%). Both companies are solid, recession-proof, dividend-yielding investments. Philip Morris International, Inc. The largest tobacco company in the US offers an impressive dividend yield of 4.20%. Pfizer Inc. The pharmaceutical company has a $166.27 billion market cap and offers a 4.10% dividend yield. However, the bottom line is that it is very difficult to be sure that any dividend share won't let you down. What's your 'bomb-proof' dividend pick? BAT, Reckitt, Diageo, Philip Morris, IMT, Rio Tinto. I realise I'm over invested in tobacco. I must be addicted. I can't bring myself to buy pharma or supermarkets.